Whether you are looking to organize your personal life at home or to collaborate on a team project with your coworkers, here are some of the best web-based project management software that can help you stay organized and on top of your work. All online project management apps discussed here offer introductory free accounts so you can use them at home or school as well without requiring any budget. And since they are online apps, you can successfully manage your projects, tasks and deadlines from virtually any computer. Basecamp from 37Signals attempts to keep you focused on the tasks at hand with its task-centric interface. 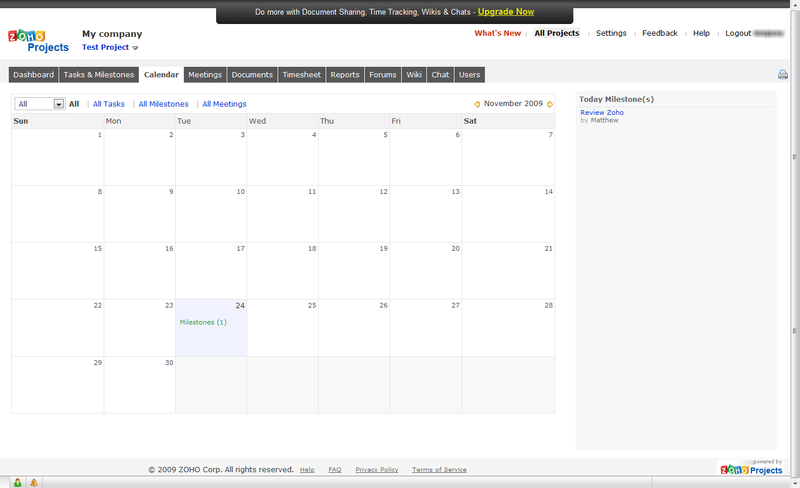 The main dashboard shows all the upcoming tasks and milestones of all of your projects organized by date. 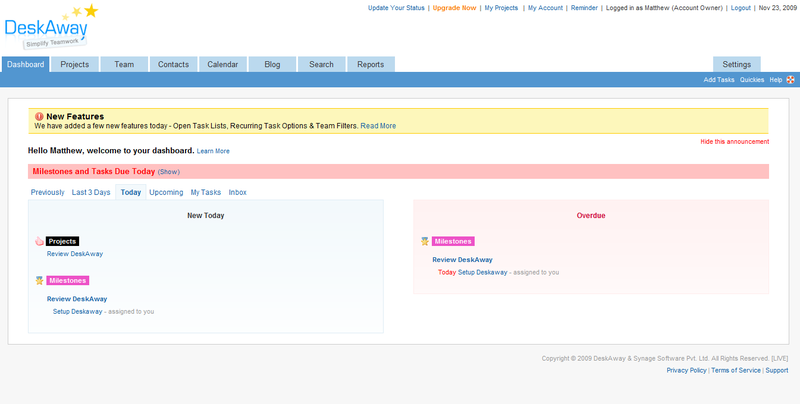 While creating to-do lists, you can assign individual items to any of the team members or everyone. There’s a message board associated with every project where you can share project updates or even post questions without having to email anyone – it’s just like an online message board but accessible only to your internal team who’s part of that project. Basecamp offers wiki-style Writeboards for collaborative writing. Project members can additionally chat with the group through Campfire which is like a web-based instant messaging tool that also save a chat transcript for reference later. Basecamp offers a free account for 1 project with unlimited users but you cannot add documents and other files to the project. For additional projects and features, upgrades are available starting at $12/month. There’s no learning curve involved. Goplan is a task-orientated project management tool that provides a discussion board, calendar, document storage (with file versioning), timesheets, tasks and tickets (e.g. for bug tracking and resolution). One of the very unique features of Goplan is that it lets you easily track the time you spend on different tasks. It works like this. When working on a particular task (or a ticket), you can start the timer inside Goplan (the clock icon) and update your status so that everyone in the team is aware of what you are working on. When you stop the timer, this gets recorded automatically in your time sheet. When creating new tasks and tickets inside Goplan, you can attach documents and other files to the project. And if you have team members who aren’t part of the project, they can still add tickets to the project by simple emailing a note to a specific email address. 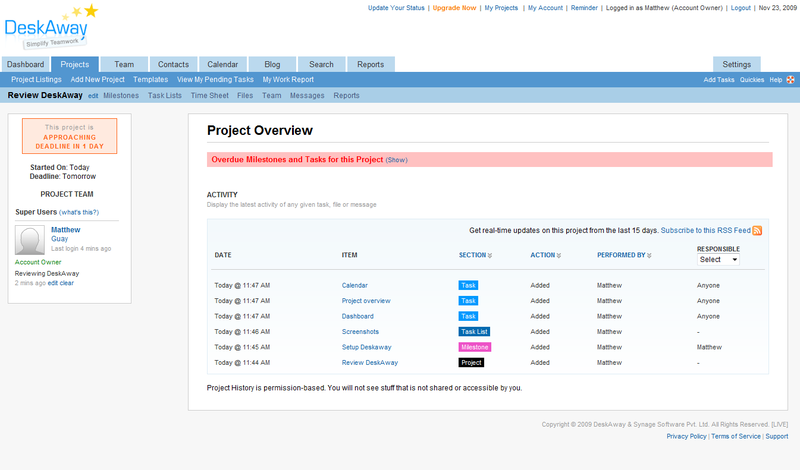 Goplan offers more projects with the free plan than most other project management apps. The free plan provides 3 projects for 2 users, and 100Mb of online storage space for your files. Upgrades are available starting at $10/month for additional projects, users, and storage. Soshiku is aimed primarily at high school and college students to help them keep track of all pending assignments and other school work. The home page shows all of the assignments that are due today, as well as upcoming events and assignments for the full week. 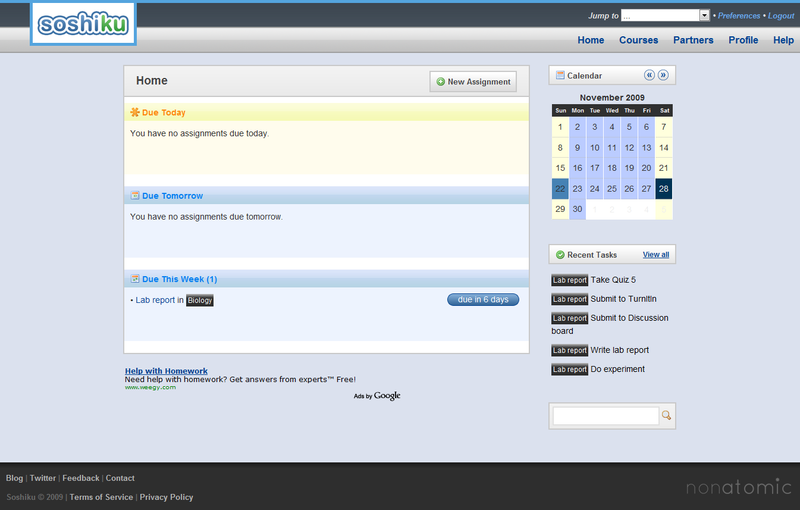 You can invite partners (or your classmates) and collaborate on class assignments within Soshiku itself. You can also attach files up to 50 MB in size with assignments. Although other project management products can be useful for students, Soshiku is designed specifically for students with no extra features and it’s completely free (supported by ads). With Harvest, you can easily track time spent on a task using the web interface or through dedicated desktop widgets available for Mac and PC. Harvest offers integration with Basecamp, so you can use Harvest’s time tracking features along with the other project management features found in Basecamp. If you are freelancer who’s using Harvest to track the time spent on a project, you can use the same tool to directly produce invoices for your clients for your time and other expenses. Once an invoice is created, the invoice dashboard keeps track of all open, past due, and recently paid invoices. Harvest offers a free account for one user with up to 2 projects, 4 clients, and unlimited invoicing, and then offers upgrades with unlimited projects and additional users and features starting at $12/month. Co-op helps you track updates from everyone in the team inside a Twitter style interface. 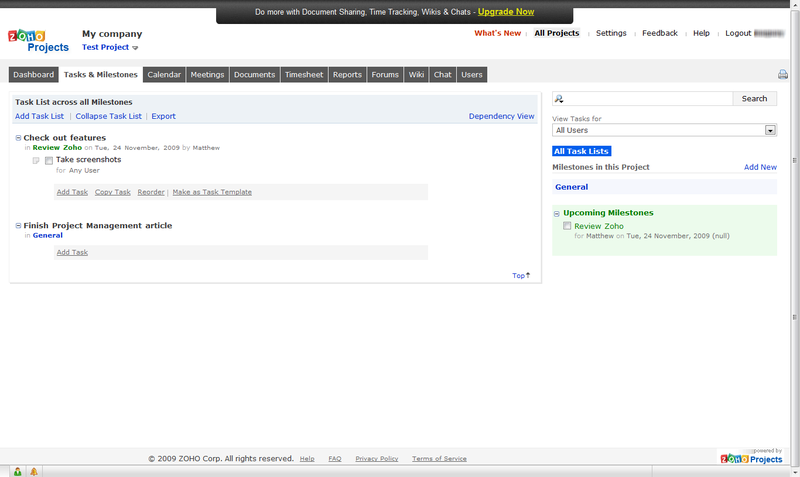 Team members can post anything in their status updates and it is visible to the entire team. The best part is that co-op includes built-in time tracking from Harvest (discussed above) so everyone know what you have been working on and for how long. If you want to keep track of your projects with graphs and reports, DeskAway could be a good service for you. DeskAway supports tasks, milestones, calendar, time sheets and file sharing. You can email all members of the project using DeskAway itself and the messages are also archived in a central location. DeskAway offers detailed reports and graphs showing information about completed, overdue, and upcoming deadlines, as well as graphs showing your overall progress on various projects. You can also create an internal blog with DeskAway for team members. DeskAway offers a free account for up to 3 active projects, 5 users, and 25MB of file storage but without support for issue tracking. You may upgrade starting at $10/month for accounts with more features including additional users, storage space and deskmail (a feature that lets you manage tasks via email). There are quite a few things that set Zoho Projects apart from competition. For instance, if you already have your project plan created inside Microsoft Project, you can import the file into Zoho Projects and easily make that switch from desktop to web based apps. Like most other Zoho services, you can log into Zoho Projects using your existing Google Account or Yahoo! credentials. Zoho Project is integrated with Google Docs so you can attach documents with your projects that are already on Google Docs. And like other online project management apps, Zoho Projects too offers an iCal feed of the project calendar so you can track milestones, tasks, etc. in Google Calendar or even Outlook. With Zoho Projects, you can add tasks and milestones to a project, and communicate with your team through wikis, built-in chat, and forums (or message board). Each forum has a unique email address so you can post replies to forums posts via a simple email message. 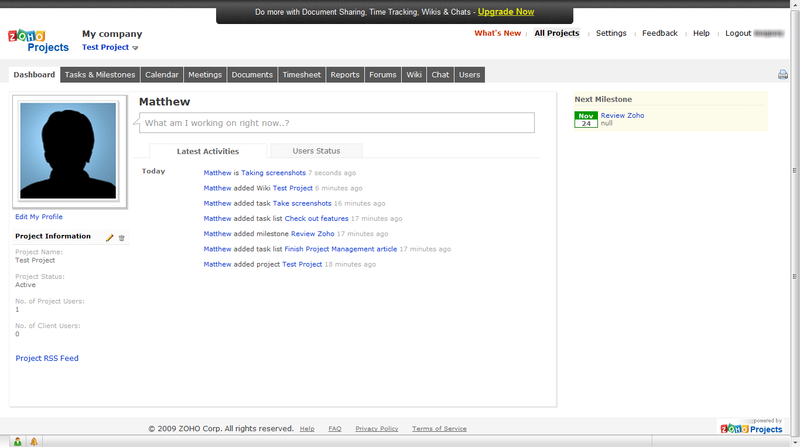 The free version of Zoho Projects will let you create a single project with 1 wiki and 100 MB of file storage. The premium version of Zoho Projects offers support for timesheets, invoices and additional projects at $12/month.